Everyone turned in their paintings today. Some outstanding work. I now understand the "Tim Bell" effect, which is to say that once you thought you painted large but now your work looks small next to his. Seriously large and excellent painting to compete against. Next year I want to be ready to put a four by four foot painting up too. That's the mac for Easton Plein Air. 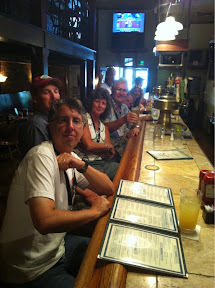 Here are some of us artists at the bar after check in. That's Oregonian Eric Bowan in the foreground. We are all just happy to be done and in from the heat. I am off to my host to jump in the pool. Will post gala pixs tonight. The quick draw tomorrow will be a scorcher! I tried sending you an email, but it kept getting returned, so I thought I'd try to contact you via your blog. I absolutely cannot wait to see the finished product! I'm gonna try to see it tomorrow morning - hopefully I'll get to see you too! !